The adjacent stable block from the 'Station Hotel' is the only surviving building on the site. The hotel was used as a hospital/convalescent home after 1902. Today several sections of trackbed are in use as a footpath/cycleway with much of the formation intact. 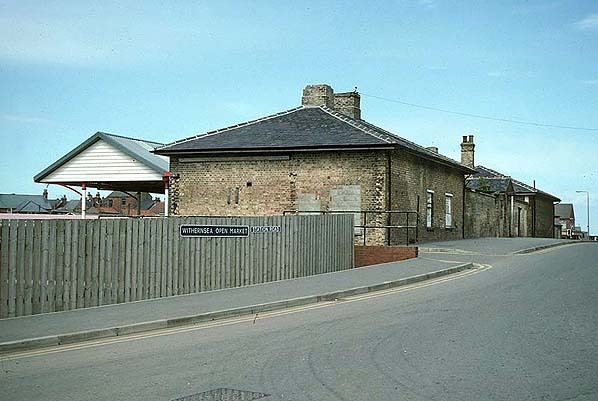 With the exception of the Withernsea terminus, all the station buildings remain, mainly in residential use..
1891 1:2,500 OS map shows the layout of Withernsea station. The platform ios on the east side of the line with the station building oo the west of the Queens Hotel. 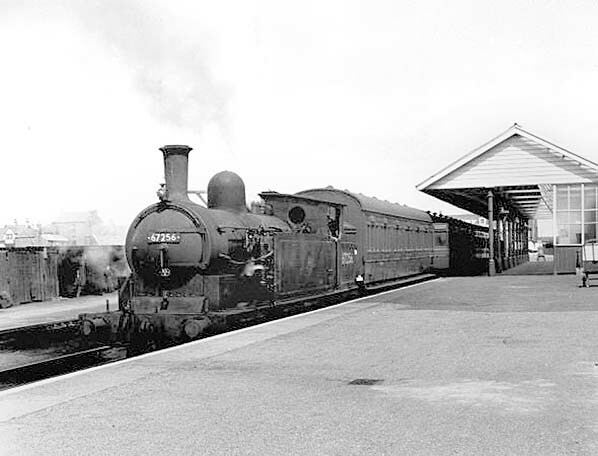 There is a run round loop opposite the platform and a turntable at the end of the line. The 3-ton capacity yard crane iks seen to the west of the siding. A single siding is seen opposite the platform controlled by a signal box on the approach to the station on the down side. The gas works was disused by the early 20th century. LNER, T.W. Worsdell designed D22 class 4-4-0 no. 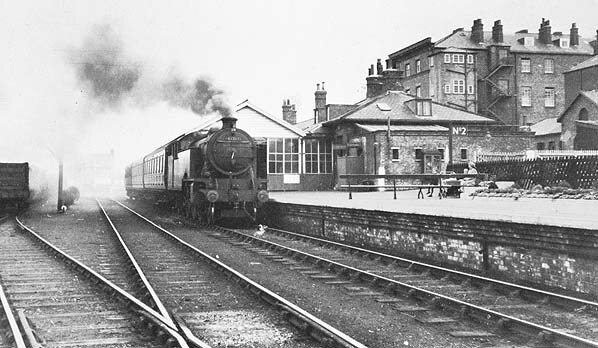 356 is in the process of running round its train having just been turned on the cramped turntable a Withernsea station on 19/8/1929. 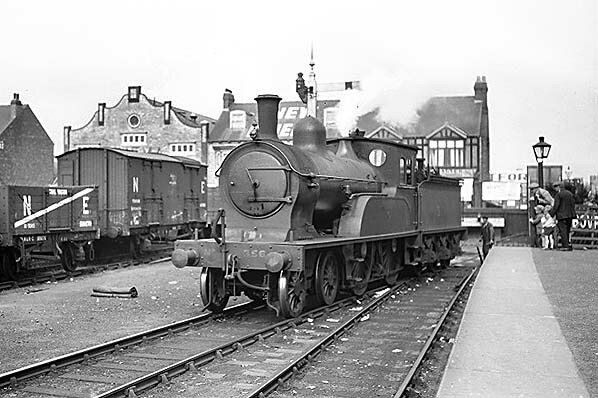 This loco was originally a NER 'F' class compound which was rebuilt as a simple in 1903. By the time this photo was taken it was based at Hull Botanic Gardens whence it was withdrawn in March 1932. The 4-wheel long wheelbase van on the left is something of a puzzle. It has two stable type doors, presumably two each side, roof vents and a sliding vent in the end bulkhead. This suggests a special cattle van although the design does not conform to that normally associated with these vehicles and especially as the bodyside appears to contain no form of ventilation. Perhaps an expert on NER/LNER vans can enlighten us. 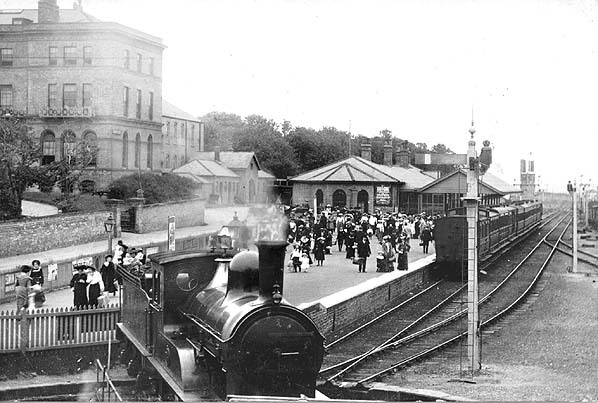 The building in the left background is the Withernsea Kinema, opened in August 1916. 'Kinema' is an archaic spelling of 'cinema' although the former spelling is not entirely obsolete. Many kinemas began life as newsreel cinemas and deliberately used the 'k' spelling in order to differentiate. Long before the days of television and at a time when a large percentage of people, particularly in rural areas, could not read and wireless was still very much in its infancy, the one way of catching up with news was to visit the newsreel cinema. One could pay 'tuppence' and walk in at almost any time and watch the continually playing newsreels. The nature of newsreel cinemas was such that they became a haunt of down-and-outs who had begged the admission fee; this and the advent of reasonably technically reliable national radio during the 1920s gradually brought an end to newsreel cinemas although a few remained popular during and after the Second World War. As far as can be ascertained, however, the Withernsea Kinema functioned largely as a 'normal' cinema from its outset. The building ceased showing films sometime in the late 1950s but survives at the time of writing as an amusement arcade. Just visible in the right background is part of Withernsea's pier towers; a nice castle-like structure which once formed the entrance to the pier. 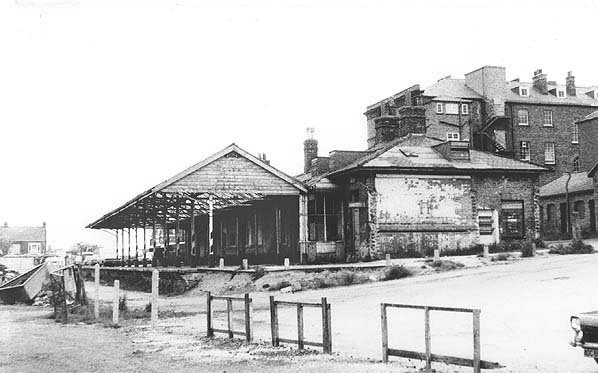 Withernsea pier has long since ceased to exist and had gone even before this photograph was taken. The pier opened to the public in 1878 with an admission fee of one penny but not on its originally proposed site near the bandstand. 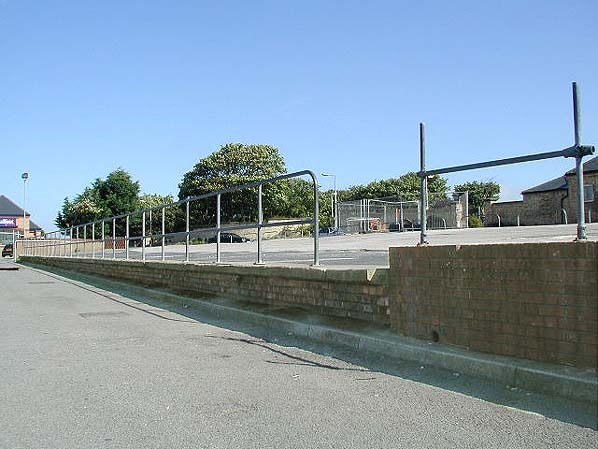 The site on which it was eventually constructed was chosen to allow goods to be unloaded from ships and taken the short distance to the railway station for onwards transportation or vice versa. Sadly the 1196ft pier was frequently damaged by collisions with vessels and with an almost 'give up' approach had been entirely dismantled by 1905, leaving just the towers which survive to this day. 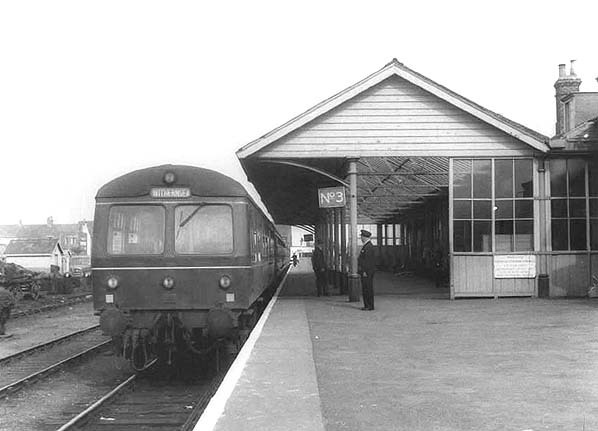 Withernsea Station in the late 1950's with a DMU arriving at platform 3. The station master looks on. 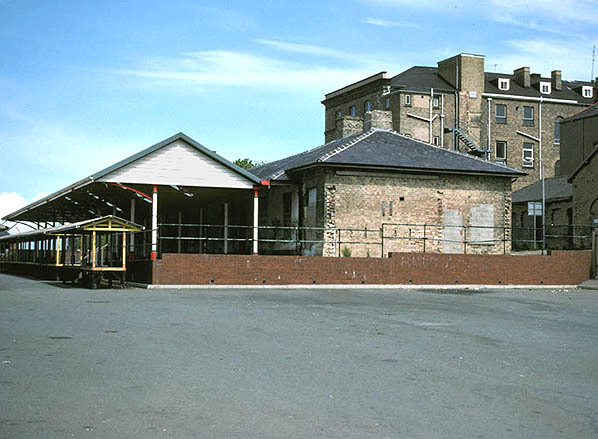 Withernsea Station on May 2005. 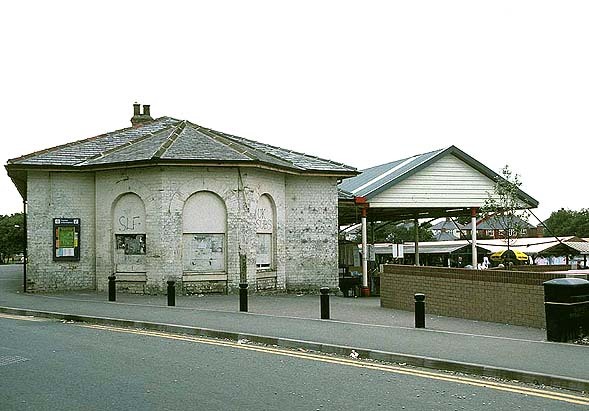 Withernsea Station in September 1990.